Araucaria heterophylla is not really a true pine. 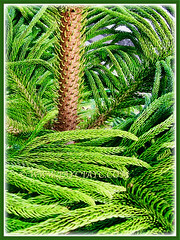 Norfolk Island Pine, an exotic tree with distinct symmetrical shape is one of the most popularly and widely grown species. This majestic, beautiful and coniferous tree is planted abundantly as an ornamental and landscape tree. 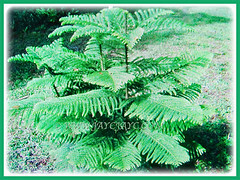 Botanical Name: Araucaria heterophylla (syn. : Araucaria excelsa, Eutassa heterophylla). 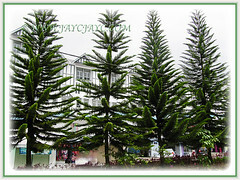 Common Names: Norfolk Island Pine, Star Pine, Triangle Tree, Living Christmas Tree. Etymology: The generic name, Araucaria is named after the Spanish exonym Aurocano which is applied to the Mapuches of central Chile and south-west Argentina. The specific epithet heterophylla (‘different leaves’) refers to the variation in the leaves between young and adult plants. Origin: Native to Norfolk Island, New Caledonia, eastern Australia, New Guinea, Argentina, Chile and southern Brazil. It is widely cultivated in many parts of the world. Plant type: An ornamental, evergreen and coniferous tree. Features: Araucaria heterophylla is a species of the genus Araucaria that comprises of about 15 species. Slow-growing, these trees with straight vertical trunks and symmetrical branches can reach between 50–65 m tall. The bark is grey-brown in colour, exfoliating in fine scales. The bright green-coloured young leaves adorned on young trees are needle-like or awl-shaped, 1-1.5 cm long, about 1 mm thick at the base and incurved, 5–10 mm long. The older trees tend to have branches closer together and darker leaves that are scale-like and overlapping, about 0.6 cm long. The thickest, scale-like leaves on coning branches are in the upper crown. The somewhat large cones are squat globose, 10–12 cm long and 12–14 cm diameter. 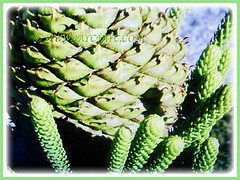 These female and male cones take about 18 months to mature. On maturity, they release the seeds which are nut-like edible. 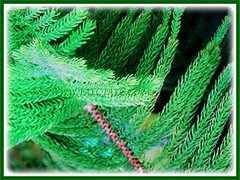 Due to its symmetrical shape as a sapling, it is commonly called a Star Pine, Triangle tree or Living Christmas Tree, although it is not a true pine. 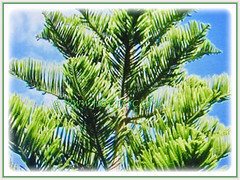 Culture (Care): Araucaria heterophylla or Norfolk Island Pine can be easily grown with moderate care. Light: Best in a bright indirect light location. Can tolerate semi-shade spots. It can tolerate shade but the leaves will drop, the deeper the shade, the droopier the leaves. Moisture: Medium water needs. Best to keep the soil on the dry side, watering thoroughly and draining off any excess water. Overwatering can cause root rot. It benefits from humid environment. Soil: Sandy and loamy soils. It is very tolerant of soil with high salt concentrations. Commercial potting soil mix that is fast-draining and sterile will be just fine. Others: Never cut off the top or trim the sides of this tree. You can remove any lower branches that die, using a sharp pruner to prevent tearing the stems. The only pruning that should be done is snipping off brown tips and dead branches. If the brown branches seem to be high on the tree or if they are found all over the tree, this is a sign that the plant is either overwatered, underwater or is not getting enough humidity. Use a humidifier to increase humidity. 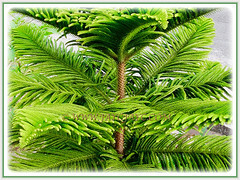 Do not repot unnecessarily as the Norfolk Island Pine has weak root systems. Feed once fortnightly with a water soluble balanced fertiliser at ½ strength. Generally free from serious insect or disease problems. However, do watch out for spider mites and mealybugs, especially for indoor plants and treat any infestation immediately. For subtropical and temperate regions: Hardiness: USDA Zone 10 – 11. It is distributed extensively in humid-subtropical regions. 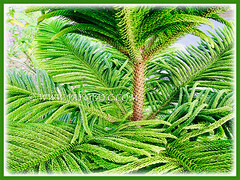 Norfolk Island Pine is very sensitive to frost. Young trees are often grown as houseplants in areas where the winters are too cold for them to grow outside. Bring the potted plant back indoors if the temperature drops below 10°C. It will begin to sustain damage at temperatures below 4.4°C, beginning with discolouration of foliage. Keep it away from cold drafts. It needs sufficient humidity to thrive well. Use a humidifier or mist the tree weekly to increase humidity. Feed in spring and summer but withhold in the fall and winter. Keep the soil evenly moist from spring to summer, lightly moist during the cooler seasons. Propagation: It can be propagated from cuttings. Take 15-20 cm cuttings of the terminal leader and treat with rooting hormone. May be propagated from seeds though usually commercially produced. Usage: Araucaria heterophylla or Triangle Tree with its distinctive symmetrical shape will be excellent when planted in a row or in avenues. Ideal as spectacular specimen plants when situated on large expanses of lawn. A very tough and resilient tree that is most suited in public parks and urban landscapes. A magnificent and ornamental tree when planted on the ground. Also, useful for container gardening outdoors or indoors as houseplants. As timber, they are used as material for woodturning. 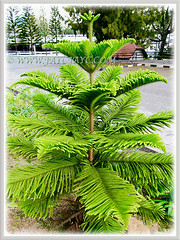 It is popularly used as a substitute and living Christmas tree. Ideal to be trained as a beautiful bonsai tree too.